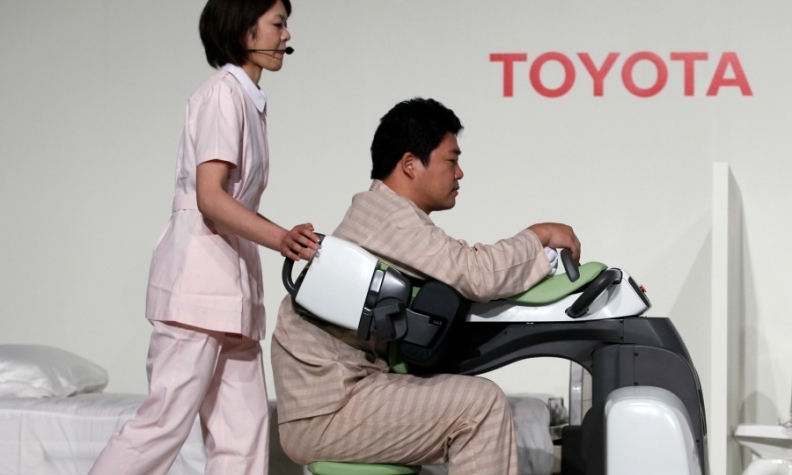 Toyota has been working on robots including a motorized wheelchair (shown) that can scale stairs. TOKYO -- The researcher hired by Toyota Motor Corp. to spearhead its robotics and artificial intelligence efforts says the automaker's production principles can be applied to build affordable helper robots for rapidly aging societies. Robot makers are struggling with the same scale challenges that the auto industry overcame with the "miracle" that occurred when Henry Ford developed the assembly line, according to Gill Pratt, the CEO of Toyota Research Institute. Toyota's vaunted production system later showed how to make cars both more cheaply and reliably, despite mistake-prone humans' role in manufacturing, he said. "My thought is, if the Toyota production system can be applied to cars, maybe it can also be applied to robots, because they're quite similar," Pratt told reporters Friday in Tokyo. He's particularly sanguine about the prospects for devices that would help the elderly age where they live. "The car of the future and the robot of the future in the home are both essentially doing the same thing." Toyota had been delving into robotic applications beyond cars before President Akio Toyoda hired Pratt last year to run a research institute that it will fund with $1 billion over five years. The interests are in keeping with a push by Prime Minister Shinzo Abe for a "robot revolution" in Japan, with a target to more than quadruple the nation's robotics industry sales to 2.4 trillion yen ($23 billion) by 2020. Toyota has been working on a motorized wheelchair that scales stairs, a helper device that retrieves objects for the bedridden, and trainers for patients rehabilitating the ability to walk and stay balanced. The world's largest automaker is forging ahead in robotics as Google, the technology giant and a challenger in the race to develop driverless cars, shows signs of pulling back. Google's parent Alphabet Inc. has put Boston Dynamics up for sale after concluding it isn't likely to produce a marketable product within the next few years, Bloomberg News reported in March. Toyota Research Institute is among the potential acquirers, a person familiar with the matter said. The Nikkei newspaper reported this month that Toyota's institute was in final talks with Google to purchase both Boston Dynamics and Schaft, the robot company founded by two Tokyo University engineers. Pratt declined to comment on whether either acquisition is in the works. He said he knows both companies well, having joined Toyota from running the robotics challenges put on by the U.S. military's Defense Advanced Research Projects Agency, or Darpa. Both competed in those challenges, with Schaft winning one of the trial races, he said. Initially reluctant to embrace automated driving, Toyoda said when setting up the research institute that his views had changed. The grandson of Toyota's founder suggested accepting the technology could be a matter of survival, hearkening back to cars replacing horses as the preferred means of transportation and saying he wanted vehicles to remain loved by people. "The car of the future is as much about software as it is about hardware, and as you put software and hardware together, what you get is a robot," Pratt said. "A robot is a kind of machine that senses and thinks and acts, and a mobile robot is one that does those things where the acting involves moving around." Robots in the home also will need to perceive the world around them, respond to commands, and think, plan and take action on their own, Pratt said. Toyota has the means to apply the same scale it's used to make Corolla compact cars affordable in bringing down the cost of robots. "It is extraordinary that a very wide segment of society can afford cars," Pratt said. "Cars are everywhere. I see no reason that robots couldn't be everywhere as well." Pratt says he's also optimistic about the prospects for robots because the populations are aging in some of Toyota's most crucial markets, including at home in Japan. More than a quarter of Japan's population is over 65, a higher rate than any other nation. "The market's going to be there," he said. "And now the only question is, can we apply the Toyota production system to that market? And I think that we can."